There are many components to wellness. The way we eat, ai pono. A connection to the land (‘aina), to family (‘ohana), to breath (aloha) and our own personal power (mana). ”I ola no ke kino i ka ma’ona o ka opu.” The body enjoys health when the stomach is well filled.In the Hawaiian language, with all its many beautiful layers of meaning, the translation goes beyond literal. When I look at this and I feel into what this is saying, it’s not just talking about being full. Ai means to eat, to nourish. Pono is balance, harmony. Ai pono is filled with wellness. With ai pono, we eat in a way that’s in perfect order with your wellbeing, in it’s wholeness There is a certain ease to the way we are eating that provides us with the most efficiency and the highest amount of mana, life force. The ai pono diet was practiced by our ancestors. It was primarily plant based. Unlike the American diet, which has the protein as the larger part of the meal with small sides around it, the ai pono diet had the kalo, taro plant, as the main source. Kalo is thought to be our ancestor, Haloa. Kalo is very nourishing. It’s a nutrient-rich food source . It can be served in a paste called poi, or steamed. Hawaiians ate many greens in our diet: limus, seaweeds. Pohole, fern. Lu’au, the leaf of the taro plant. They ate other starches, ‘uala, sweet potato. Uhi, yam, U-H-I. Ulu, U-L-U, which is breadfruit. Also, fruits. All were unprocessed and unrefined, naturally occurring in the land. Hawaiians ate fish. Fresh fish from the sea or dried fish in off-seasons. This allowed us a high nutrient diet, very easily digestible. We also had a lot of fermented foods. Poi has a lot of microbacteria to help with digestion. For all these reasons, the body was able to balance the food that we ate. Meat like pig and chicken were just a small part of the diet. These foods were reserved for the higher class, the ali’i. The commoners, ate ai pono. They were the worker bees. They needed that energy to be able to fish and farm and do all of the work that needed to be done in the village. ‘Aina means the land that feeds and nourishes. Having a familial connection to the land really brings me to the understanding of ‘aina. Hawaiians identify very closely, genealogically with the land. A connection with the land is interwoven into the Hawaiian understanding of relationships and wellbeing. At the Hawaiian Lomi Association conference, kumu Keala Thompson was very inspiring. He shared about a patient and family member who was over 250 pounds and eating a Western. The man found himself in the hospital with heart problems, high blood pressure and high cholesterol. Sadly, these are common problems our Hawaiian people are plagued with today. So so far from, health wise, from how our ancestors ate. He started the ai pono diet. In two months he had lost 50 pounds. His blood pressure was down. His cholesterol was down. He was living a totally different existence. Together with exercise, ai pono can be so beneficial for all of us. It really speaks to our concept of living pono and what that really means. Living pono a a lifestyle, not just what we eat, but also how we move and take care of our bodies, how we move. While I was on Big Island, another aunty shared with me about her Hawaiian neighbor, who was obese…more than 300 pounds. He had very swollen ankles and looked so uncomfortable. But, he started walking. First she saw him walking a block with a cane. He looked really uncomfortable. Slow and deliberate. A couple months goes by, and she sees him again. Now he’s walking all the way around the block a couple times. Pretty soon, after one year, he lost 150 pounds, and he was running in her neighborhood! This is what happens when we are living in pono. We make a daily decision, moment to moment, to interact in a harmonious way towards ourself, towards others, and towards the divine. We are not here alone. We have a responsibility to a whole ‘ohana, a family. And it’s not just our family. Our Earth family. Our human family. No matter the race, or religion, we have a calling to serve the family. In ‘ohana, we understand that everybody has their place. Their unique contribution. Different opinions to be valued. We can be teachers for one another in the family. When there’s a disharmony and we come powerfully to harmony, we pave the way for future generations to also behave in a way that’s in alignment. 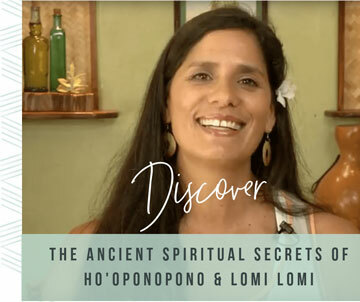 Living in pono also means that we’re watching our mana, our life force, our personal power. We mindfully put in food, thoughts and influence to increase our mana.Your thoughts that are positive. We are always striving for excellence. For the highest outcome, and we call that ho’omana. To raise our mana. To be empowered. The breath. Deep breathing. Finding the calm in your day. Taking moments to feel that connection to Source and breath of life. The breath of Source moves through us and oxygenates every muscle and every bone in the body. Aloha in the way we love others and allow people to be where they’re at. We meet people where they’re at coming from a place of aloha and from the heart. Pono living, in harmony with ‘ohana, mana and aloha, we become that lo’i, the garden that can flourish. A garden were future can spring forth. Oha, the shoots that come off of the mama corm of taro, is the very foundation of this lifestyle. It is understanding that we are all connected to the same source. We come from the same root. Be inspired to live a lifestyle of connectedness, of harmony, of pono. I hope you will begin to incorporate this concept of ai pono and living in pono, into your daily life. I’d love to know what that looks like for you. Share in the comments below!